Tours depart 3 times per day: 10.30 am, 3.30 pm and 5.15 pm. We are comparing Skip the line Milan Duomo Tour with Rooftop Access Prices from leading ticket suppliers and Try to find you Cheap tickets prices on the market. Meet at the entrance to Milan's most famous building, Duomo Cathedral, an architectural masterpiece which took a total of 600 years to construct. After skipping the line you will be introduced to your knowledgeable guide who will be happy to share all the historical facts and fun fairy tales behind the cathedral. Your 1-hour tour will take you to Duomo's magical rooftop terraces so don't leave home without a fully charged camera because, whether you choose to visit during the day, or take the tour in the romantic twilight, the city views are something very special. Your guide will fill you in the origins of the cathedrals tall spires, looming gargoyles and marble statues. You'll also have some time to pose for photos under the glittering golden sculpture known as La Madonnina before returning down a narrow staircase and to the cathedral entrance for views of Duomo's elaborate facade. For anyone who wants to visit one of Milan's most popular attractions. Convenient for people on a tight time scale. This tour will be interesting for people who like art, history, religion and panoramic city views. 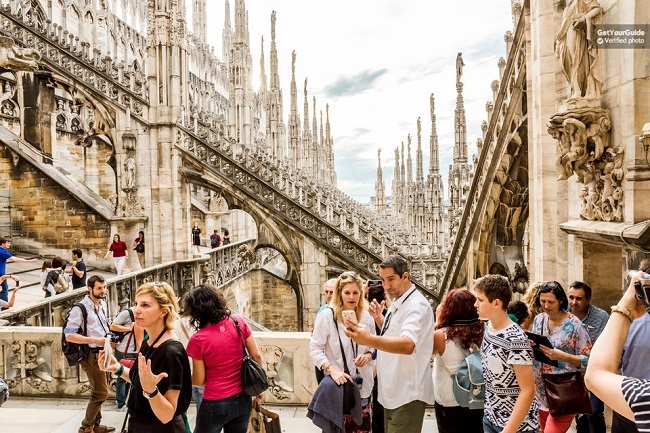 Your Experience With Skip the line Milan Duomo Tour with Rooftop Access? Save time with this Skip the Line entrance ticket to Duomo Cathedral and it's stunning rooftop terrace. Enjoy spectacular views of the city centre, by daylight or illuminated in the evening. Take a guided tour of Milan Duomo with an expert, English speaking guide and learn about this iconic building. What Skip the line Milan Duomo Tour with Rooftop Access Includes? Fast track entrance to Milan Duomo and Terraces. Headsets if groups are larger than 6 people. Travelers Reviews about Skip the line Milan Duomo Tour with Rooftop Access? This tour ticket has a 4.4-star rating on Get Your Guide. It has a 4.5-star rating on TripAdvisor. Travellers also gave the tour 4.5-stars on Viator. Comments agree that skip the line is essential during the summer season. Travellers also say that tour guides are knowledgeable and the cathedral is charming. Please cancel at least 7 days in advance for a full refund and 3-5 days in advance for a 50% refund. In the event of severe weather Duomo's terraces may be closed for safety. Clothing: You must have shoulders and knees covered to enter the cathedral, please wear comfortable, flat footwear (ideally trainers as stairs can be slippery), a sunhat and water for hot days and a waterproof jacket for wet and windy days. There may be a short wait for the elevator to terraces 1st level. Duomo Entrance: Piazza del Duomo No. 4, 20122 Milano.